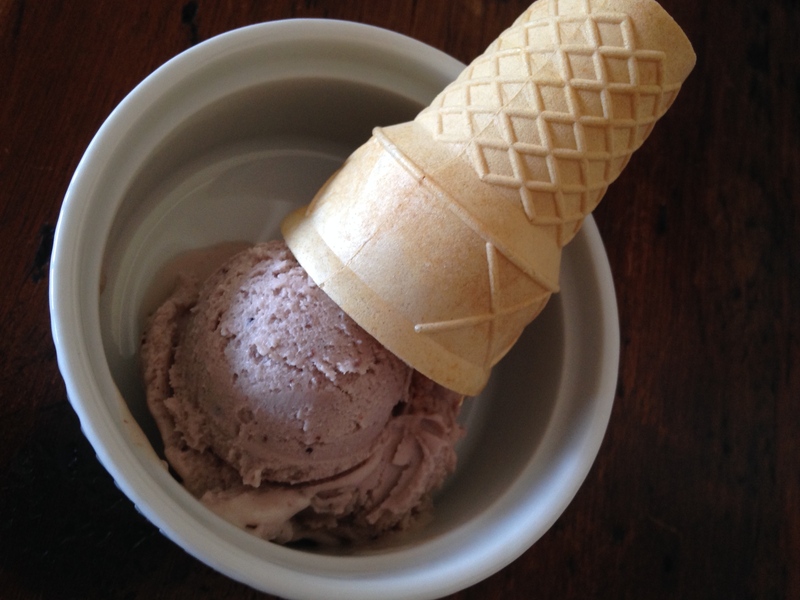 Fresh, delicious, homemade blueberry ice cream! Can you believe that lavender color? Amazing. Are you wondering why the cone? Well, every weekend we retreat to our house on Long Island. Now that it is gorgeous out, everyone is lining up for ice cream cones at the ice cream shop downtown. They don’t carry any vegan ice cream so we decided to bring our own ice cream and cones into town and walk around town just like everyone else! * I freeze fresh blueberries when they get a little soft and keep them at the ready for shakey-shakes and ice cream days. Combine the coconut milk, sugar, and vanilla. Puree the blueberries in the food processor with the lemon juice. Pour through a fine mesh strainer and press with the back of a spoon in order to get the smooth blueberry juice. Discard the rest. Whisk into the coconut milk mixture and refrigerate for at least 2 hours. Pour the coconut milk mixture into the ice cream maker and churn for 10 to 15 minutes. Place into a freezer safe container and freeze. Enjoy! I must give this a try. It sounds delicious and I happen to have all the ingredients. Thanks.